Store closed but Rose was still inside. She bid good night to the azaleas, the carnations, and the daisies. To the dandelions, forget-me-nots, and forsythias, she promised them the next day. A pleasant evening she wished to the magnolias and snapdragons before she proceeded to the door. One twist of the doorknob and a couple more footsteps to the exit would've changed just a little how Ricky would find Rose the next morning. Alas, how people would die they had no ultimate say in it. Heart stopped. Nails turned blue. 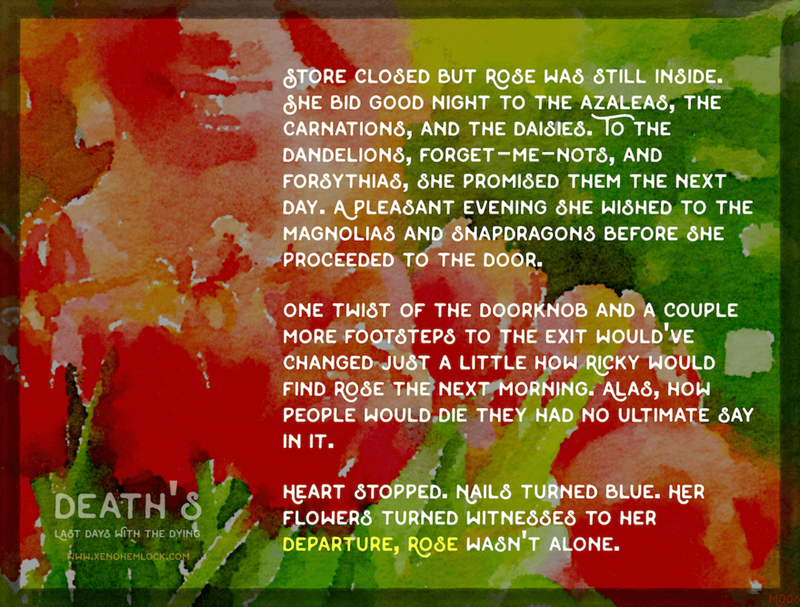 Her flowers turned witnesses to her departure, Rose wasn't alone.